Say buh-bye to avoiding mangoes just because you don’t know how to cut them, my friends. The pit of a mango has an awkward and misunderstood shape, making it an intimidating fruit to cut into. I spent years scratching my head every time one of these succulent fruits found itself upon my counter. This beautiful weather is almost too much to comprehend. I'm finding that it is very difficult NOT to put on a coat when I go outside. It's been a habit for so many months! And just when I break that habit, the cold front will blow in. It looks like it's going to be in the 30s again by the weekend. Do you ever take a series of photos of a particular food and forget that you took them? 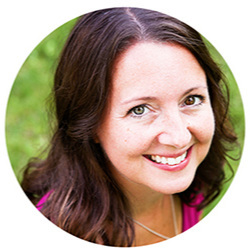 Only to find them, weeks later, screaming out to you from Lightroom? That's exactly what I did to these parfaits. And I feel terrible because they were delicious. I hope they can find it in their crunchy, creamy, fruity hearts to forgive me. I had made this delicious granola as one of my challenge recipes, and knew that I wanted to throw it together with some other ingredients to create some sort of parfait. I pondered these parfaits in my sleep. I do that every so often. Ponder food in my sleep. I purchased two of those convenient little 6-oz. containers of Greek yogurt and mixed about a tablespoon of honey in each container. I put the yogurt-honey mixtures into the bottoms of two separate tall glasses. I put a few spoonfuls of granola on top of the yogurt. Easy, delicious breakfast served! Just like that. A Chipotle-Mango flavored marinade packs a punch in this grilled chicken recipe, perfect for your summer BBQ. Take advantage of in-season mangos and fresh tastes of cilantro and smoky adobo chilies for a WoW grilled dinner! 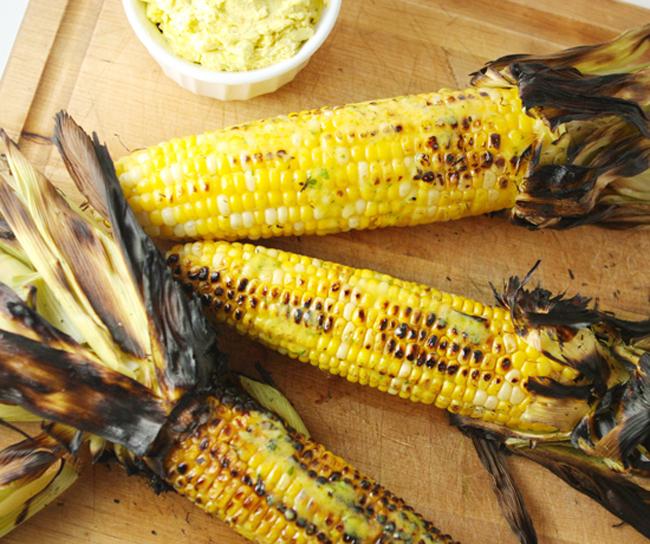 Grilling your sweet corn is possibly the best way to eat the ear. Pairing it with a mango-habanero butter is the perfect spicy sweet combination to include. Possibly my favorite way to enjoy an ear of corn. This butter is DELICIOUS! The weather in Minnesota is always unpredictable, but we have had an extra dose of unpredictability this year. One day it feels like we live in Florida, the next we are in Alaska and the next Seattle. If you like variety, we're your place! Yesterday was a Seattle day, but I refused to let that keep me from lighting up the grill. Should I boil corn before grilling it? 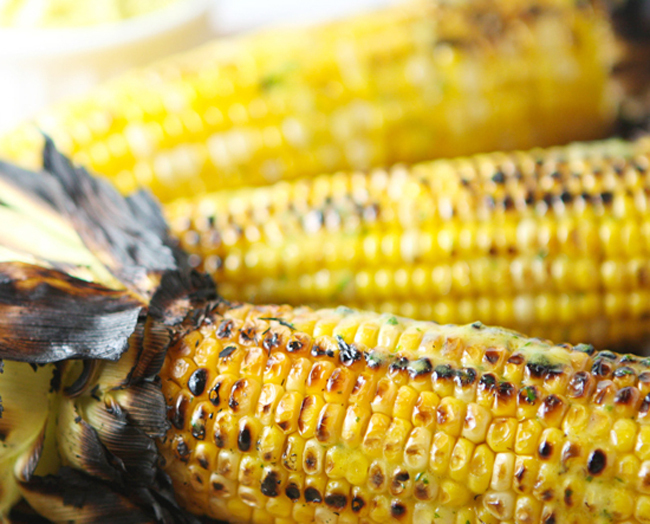 In order to provide enough moisture for the grill, it’s important to soak the corn in water for 10 minutes. 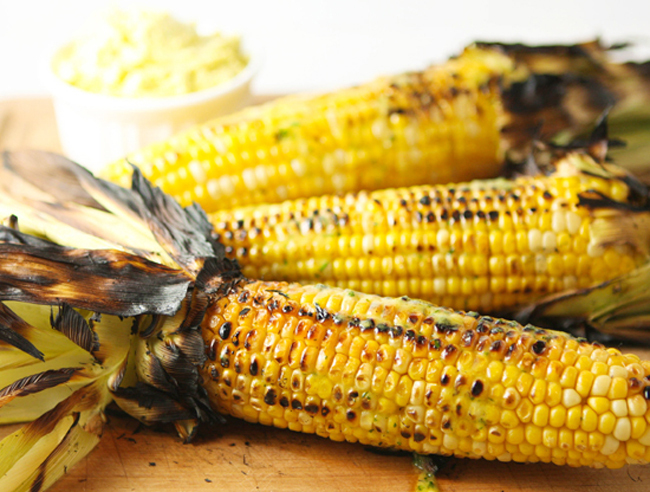 Can I skip the grilling and just eat the corn after boiling it? Yes, it would lose the amazing flavor that charring the kernels offers but it would still be amazing and the mango-habanero butter would be just as tasty. 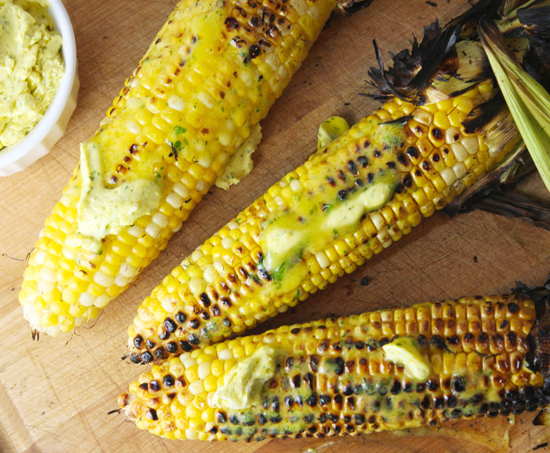 What other flavors would be good on grilled corn? You can’t go wrong with a Mexican style which is mayo, sour cream and spices. I also love adding Spicy Cilantro Lime Butter. This grilled corn turned out absolutely delicious despite the weather. And the mango-habanero butter I slathered all over it? Oh my dear goodness was it good. Start out by making the butter. Bring to a simmer and cook over moderate heat, stirring occasionally, until the mango is very soft, about 10 minutes. Transfer to a food processor and puree until smooth. Strain the mango puree into a small bowl and let cool, about 30 minutes. Scrape the mango butter into a small bowl, cover and refrigerate until chilled, about 30 minutes. Light a grill or preheat a grill pan. Pull the husks from 8 ears of corn down to the base of the stalks, leaving the husks attached. Discard the corn silk. Using butcher string, tie back the husks. Fill a large bowl with cold salted water and submerge the ears of corn for about 10 minutes. Drain the corn but don't pat it dry. Grill the corn over moderate heat, turning occasionally, until tender and browned in spots, about 8 minutes. 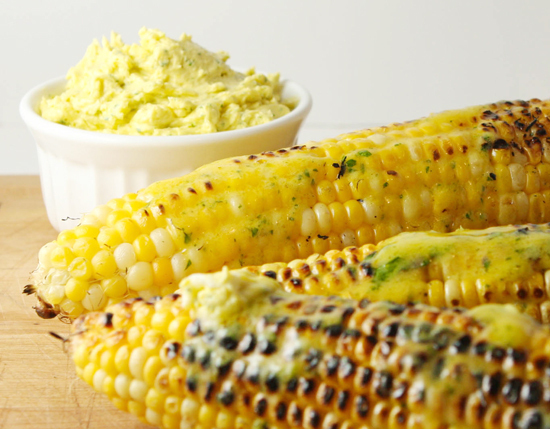 Transfer the corn to plates, spread with the mango-habanero butter and serve! My husband and I each devoured 2 ears of mango-buttered corn within minutes of removing them from the grill. We are thoroughly enjoying the butter, even today. It adorned our toast this morning, and I plan to put it on a sandwich in just a bit. Enjoy! Contributed by Megan Porta from pipandebby.com. 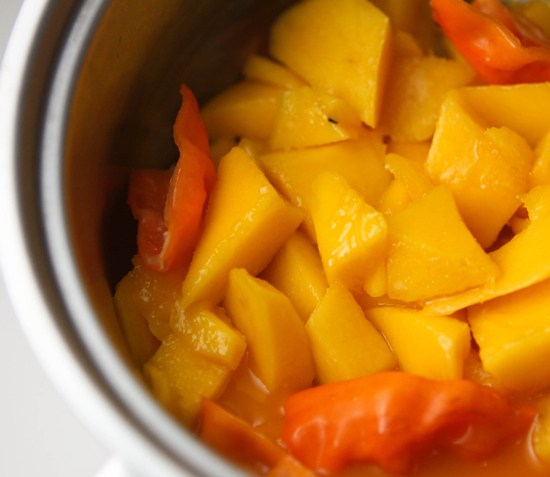 In a small saucepan, combine the chopped mango with mango nectar, honey and habanero chile. Bring to a simmer and cook over medium heat, stirring occassionally, until the mango is very soft, about 10 minutes. Transfer to a food processor and puree until smooth. Strain the mango puree into a small bowl and let cool, about 30 minutes. Wipe out the food processor. Add the cooled mango puree along with the butter, chopped cilantro and salt and puree until smooth. Scrape the mango butter into a small bowl, cover and refrigerate until chilled, about 30 minutes. Light a grill or preheat a grill pan. Pull the corn husks down to the base of the stalks, leaving the husks attached. Discard the corn silk. Using the butcher string, tie back the husks. Fill a large bowl with cold salted water and submerge the ears of the corn for about 10 minutes. Drain the corn, but don't pat dry. Grill the corn over moderate heat, turning occassionally, until tender and browned in spots, about 8 minutes. Transfer the corn to plates, spread with mango-habanero butter and serve. Don’t let grilling season go by without enjoying this excellently flavored chicken and salsa. You’ll love the underlying coconut flavor that peeks through. So many flavors that come perfectly together to give you a bite of happiness in this fabulous little meal.